MakeMyTrip offering Domestic Flights Rs. 1200 Cashback on Rs. 5000 only on MakeMyTrip App for Axis Bank Debit & Credit card Customers. • To avail the offer, customer must enter E-Coupon MMTWED in the E-Coupon field. • This offer is valid on AXIS Bank credit and debit cards only. • The offer is valid only on Wednesdays starting 2nd November to 28th December’2016. • The offer is valid on bookings made between 1800 hrs to 2359 hrs on every Wednesday. • The offer is valid for bookings made on MakeMyTrip’s Android & iOS App only. • The offer is valid on 1 booking per card per Wednesday using the above offer code. • Offer is not applicable on payments made through My Wallet (MakeMyTrip Wallet – bonus amount), 3rd party wallets, payback points, COD, Pay Pal, Pay at Hotel, EMI and net banking payments. How to get Axis Bank Cards Domestic Flights Rs. 1200 Cashback on Rs. 5000 @ MakeMyTrip App? 3. Make booking of Rs. 5000 or more using coupon code MMTWED between 6PM to 11.59PM every wednesday from 2nd Nov to 28 Dec 2016. 4. Pay with Axis Credit and Debit cards. 5. 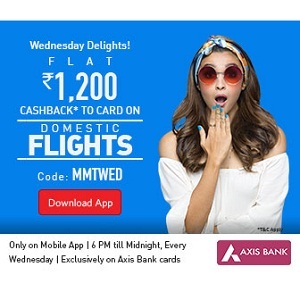 The customer will receive a cashback of Rs.1200 to card account on domestic flight bookings with a minimum card paid amount of Rs.5000 (excluding any ancillary purchased and convenience fee) paid through Axis Bank Debit & Credit Cards.